YIMBY has the first full rendering of the Naftali Group’s 210 West 77th Street, and the building’s design is impressive, significantly improving upon the structure it is replacing. Thomas Juul-Hansen is designing, and the 25 condominiums will be enormous, averaging over 3,000 square feet apiece. Permits give the full breakdown, and the 18-story tower’s 78,485 residential square feet will be complemented by a 2,317 square-foot commercial component, housing retail. The site was purchased by Naftali for $55.5 million last spring, and the number of units has shrunk from an initial estimate of 30, which is not surprising given the demand for larger, family-sized apartments on the Upper West Side. 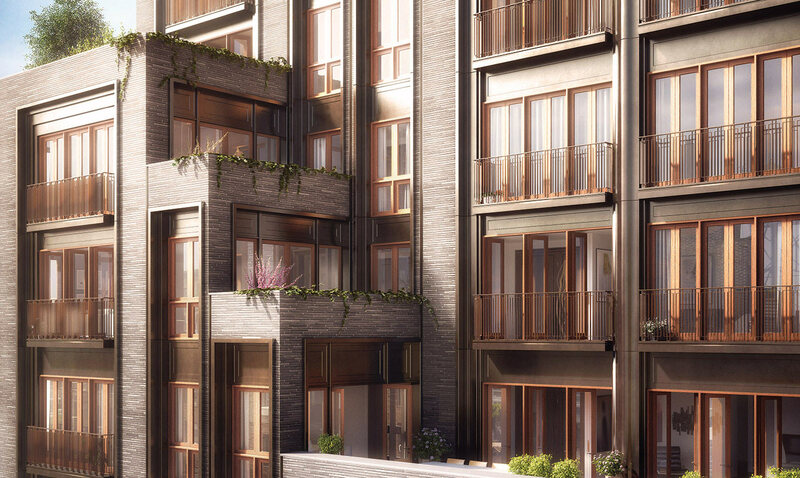 Juul-Hansen’s design is respectful of the neighborhood’s historic context, and grey bricks lining the exterior will be hand-formed, with Juliet balconies complementing mahogany-lined windows. The building’s mid-rise envelope will be flush with the sidewalk, further enhancing the streetscape. The former 210 West 77th Street was an auto garage, and is currently being dismantled. Prohibitive red tape befriends restrictive zoning over most of the Upper West Side, and development is confined to a select handful of sites, Naftali’s being one of them. This is unfortunate given proximity to local and express subways at both 72nd and 79th Streets, where the 1, 2, 3, B, and C trains run, as transit infrastructure that could easily support additional density is already available. Regardless of NIMBY-induced growth barriers, 210 West 77th Street is a positive step forward for a site that was formerly auto-centric, and sales have already begun, with prices currently rangingfrom $4.9 to $12 million. Goldstein Hill & West is the architect of record, and new building permits were approved in early August, which would signal that completion is likely one to two years out. 1700 Broadway 16th Floor, New York, NY 10019 | [email protected] | 212.759.9777 | Copyright Ⓒ 2019 Naftali Group LLC. All Rights Reserved.